H&R GT-F150 | H&R Special Springs, LP. Today, truck buyers have a dizzying array of models to choose from, ranging from four-cylinder compact trucks to $50,000+ one-ton diesels. Yet, even with all of these choices, Ford has remained the dominant force not only in the full-size truck segment, but in truck sales overall. 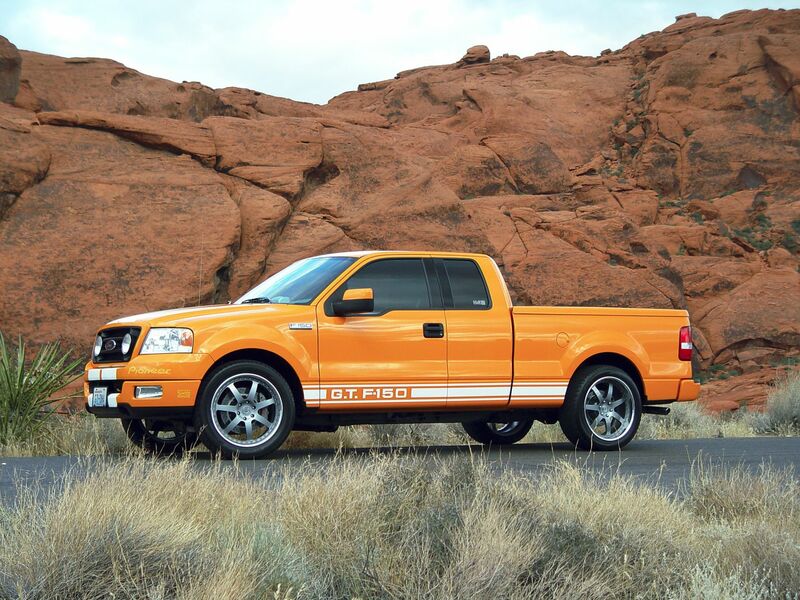 Having learned that Ford was introducing the next generation F-150, Roland Graef, president of H&R Special Springs, LP, thought it would be a great idea for his company to get its collective hands on the totally new truck, and transform it into a show-stopping F-150 for the upcoming 2003 SEMA show. It would be the perfect opportunity to showcase the new vehicle, which would be outfitted with the latest aftermarket parts. Enlisting the help of his design department guru, John Meloy, Roland set about designing a concept rendering to submit to the Ford Motor Company Project Image Program. 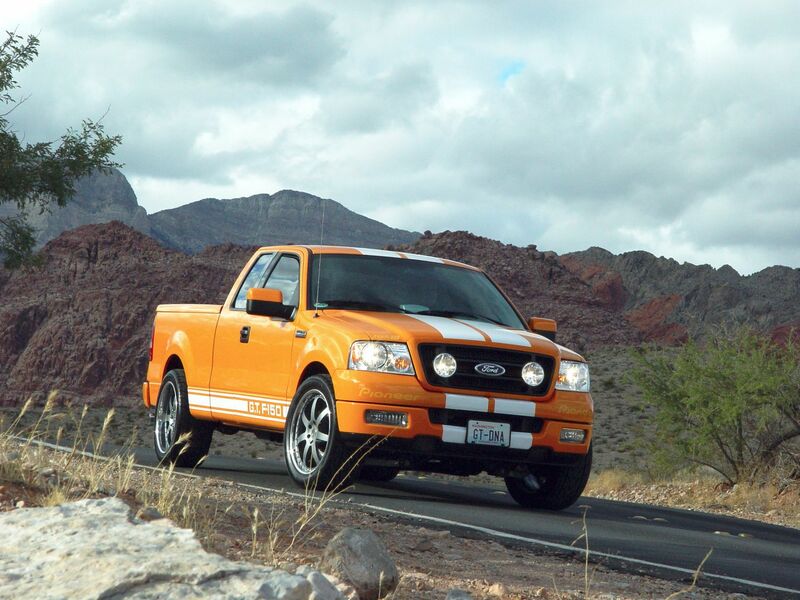 This would not be the first time Roland and the H&R crew would undertake a project vehicle of this caliber; in fact, Graef had designed and built a number of project cars and trucks in past years, including a Ford Escape that was the recipient of the Ford Product Excellence award at the 2001 SEMA show. That vehicle highlighted H&R suspension components with both a lifted off-road version and a lowered, canyon-carving performance Type R edition, both of which found favor with enthusiasts. This time, however, the subject of Roland’s attention would be a SuperCab 4WD, and its design theme would echo the styling of the GT-350 and GT-500 Mustangs that ruled streets of the ‘60s and early ‘70s. It’s no secret that Ford is big in the retro-car scene with the new GT, T-Bird and upcoming Mustang, so the company immediately warmed up to the idea of its muscle car heritage being applied to the new F-150. 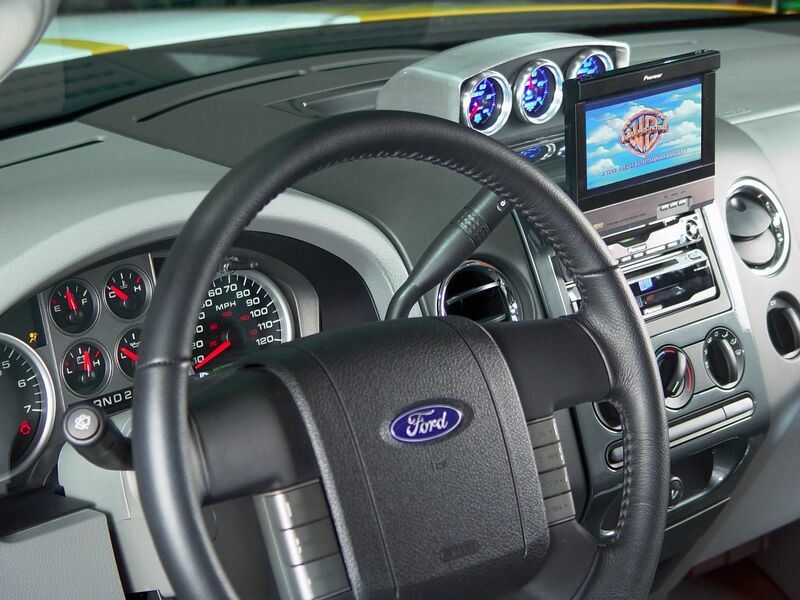 As a result, Ford gave H&R the green light for the project, but was unable to deliver an actual truck until the middle of September. This gave the H&R crew only five weeks to build a show-winning truck using aftermarket parts which weren’t even available yet. Fortunately, Roland was already well aware of the pitfalls that can plague the unwitting builder of a pre-production project vehicle, so he had started his logistical planning months earlier, working with Ford to obtain CAD drawings of the chassis, suspension and braking systems to help H&R and other aftermarket companies involved in the project get an early start. As a result, the H&R suspension components, as well as many other aftermarket products, were already waiting in the shop when the truck finally made an appearance. The team went to work immediately, and as you can see, the results were worth the considerable effort. Starting with the exterior details, the original bright red paint was completely stripped in favor of a color more representative of the muscle car era: Orange. Or more specifically, Bright Matrix Orange applied by Howard of Tri-Star Enterprise and highlighted by white GT graphics. The retina-burning shade is offset by the titanium graphite centers of custom-built, 22” three-piece forged HRE 648R wheels wrapped in Kumho ECSTA STX tires. Stylistic touches abound. Take a look at the front of the truck, and you’ll notice a custom-built grille that accommodates a set of Hella driving lights for that authentic GT Mustang look. Out back, a Gaylord’s hard tonneau cover, Permatech sprayed on bedliner (in a matching hue) and an AMP Research bed extender add extra functionality to the truck’s cargo area. 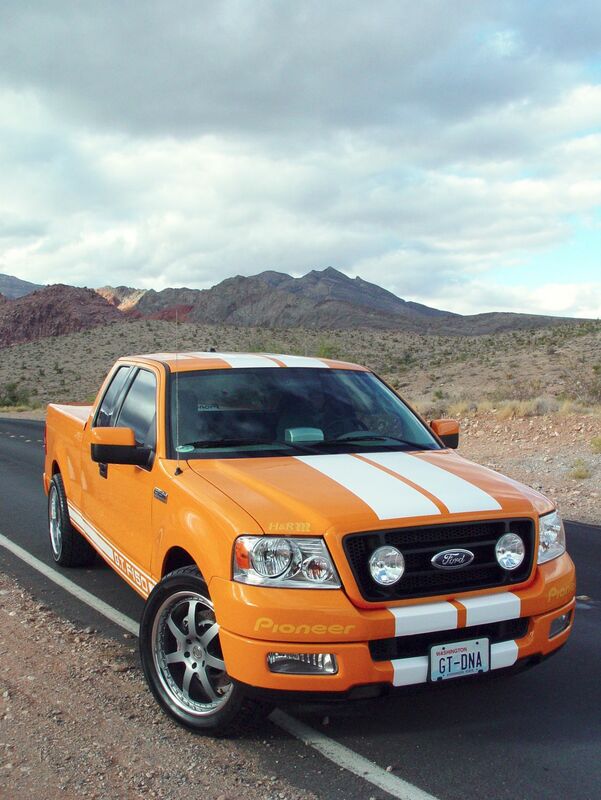 And since this truck was to be driven, not trailered to the SEMA show, Stongard film was applied to prevent wayward rocks and other debris from damaging the paint finish. An H&R designed and tuned height-adjustable coil-over suspension system was added to the front, allowing the nose of the truck to be dropped 1 to 3.5 inches. A stout 38 mm H&R front sway bar keeps the truck flat around corners, while a specially designed leaf spring lowering hanger reduces the rear ride height by a full two inches. The factory 2 inch block was also removed for an additional 2 inch lowering. Complimenting the suspension mods is a Baer Racing Extreme front brake system, which includes huge 15-inch rotors gripped by Alcon six-piston calipers. Rounding out the truck’s muscular image and adding authoritative sound is a Flowmaster Force II cat-back exhaust system complete with dual polished 2.5-inch exhaust tips. 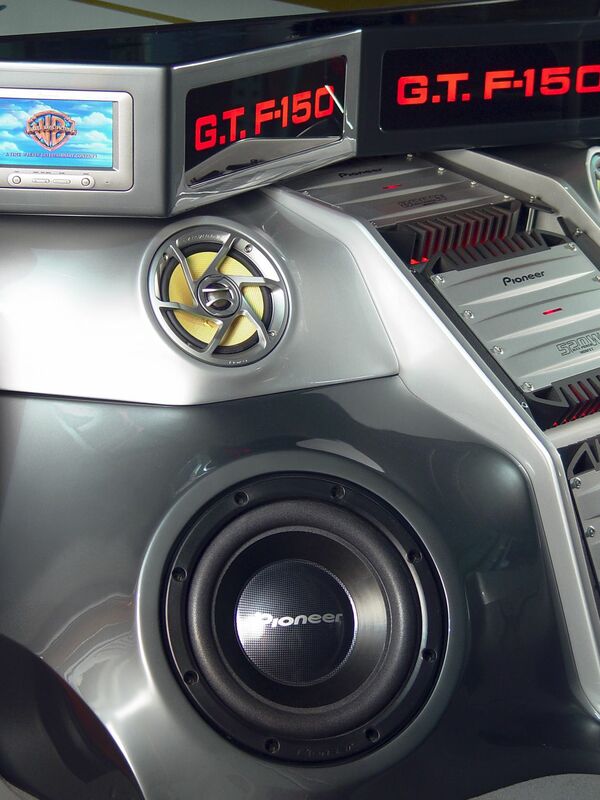 As if the truck’s visual assault wasn’t enough, step inside and get ready to have your eardrums explode with 2000 watts of pure sound. 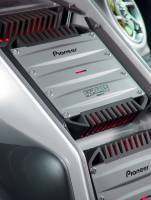 A custom, in-cab entertainment system enclosure (also designed by H&R) occupies the whole rear section of the cab, and houses a full compliment of the latest Pioneer audio/visual equipment. 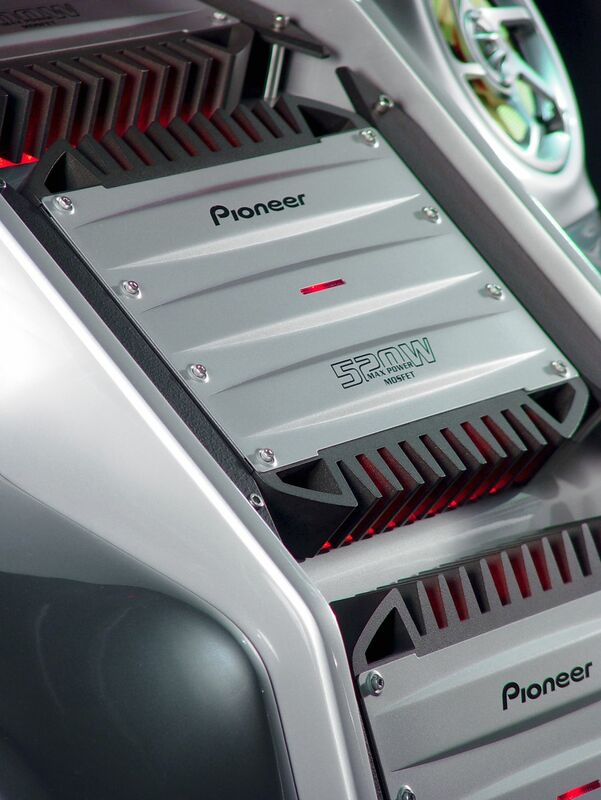 The enclosure, as well as the dash, have been finished in Titanium Graphite and Light Silver metallic paint, creating a balance of color between the front and rear that accents the black interior. The front seats and door panels are custom upholstered in black organic buff leather and orange freedom stitching for a matching design scheme. Not as visible, but a noticeable improvement to the interior acoustics, is Dynamat Xtreme sound dampening material, which was applied to every square inch of the cab underneath the carpet, as well as underneath the hood. 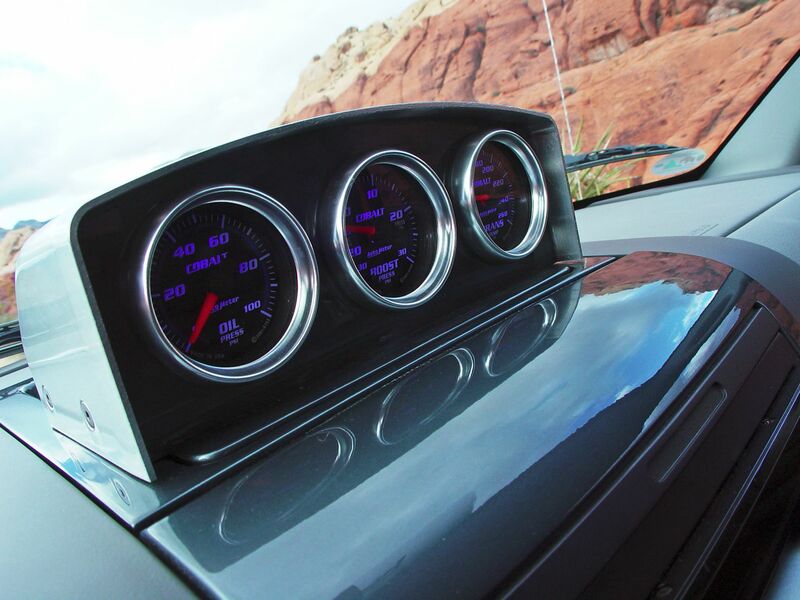 And finally, a custom-designed, billet aluminum gauge pod atop the dash plays host to three Auto Meter Cobalt gauges, which glow a gentle blue color that is easy on the eyes. H&R’s G.T. 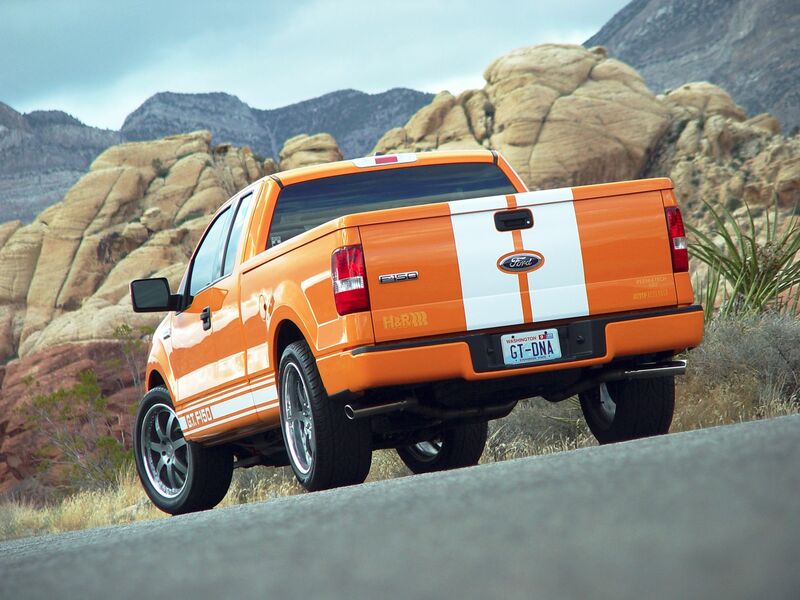 F-150 has been so tastefully executed it almost looks like a factory offering. The folks at Ford must have thought so, too, because they awarded H&R the coveted Outstanding Achievement in Design award for its efforts on the uniquely styled truck, and placed the truck in their own booth at the SEMA show. Since then, the G.T. F-150 has been on tour, making appearances at the Ford Winston Cup Race in Homestead, Florida and at the 2004 Greater Los Angeles Auto Show.